There have been many technological advances lately in the field of green, renewable energy, and a significant increase in awareness and implementation of these methods in everyday life. Their capacity to generate power rivals those of fossil fuels, and the reduced operating costs and environmental strain make them an attractive option in many parts of the world. Widespread implementation of renewables however has proven to be economically-challenging, in part due to the fact that our current infrastructure is tailored to suit fossil (especially coal) burning power plants. One promising solution to this is a technology known as solar-thermal energy. 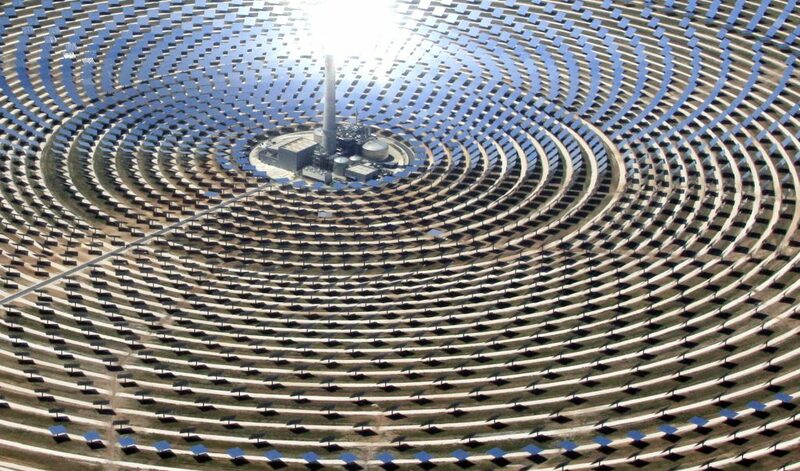 Solar-thermal plants harness solar energy to generate either heat or electricity, and when coupled with a cost-effective thermal storage strategy, they can deliver baseload electricity through the existing power grid. Unfortunately, to be an economically attractive option, solar-thermal energy generation requires rather large installs, at tens of megawatts of capacity, which can be quite expensive. Gemsolar Power Plant in Sevillia, Spain. 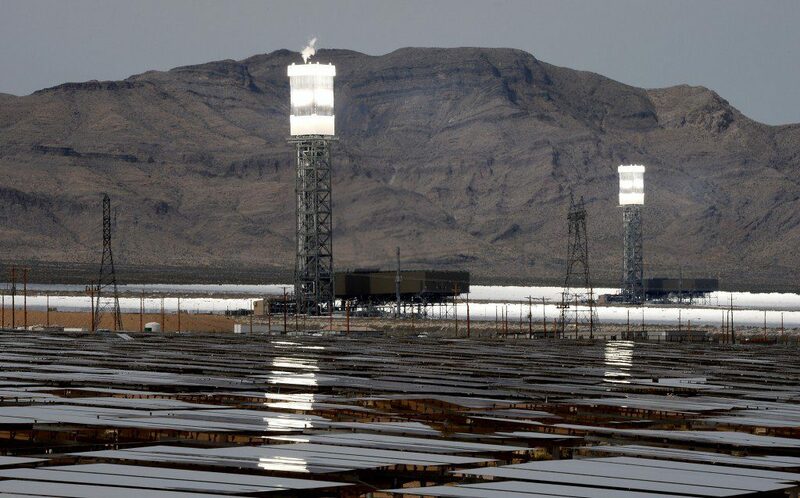 The tower houses molten salt, serving as a thermal “battery”. A new approach seeks to solve both the economically-demanding process of replacing existing power plants with new ones, and address the ever-more-pressing issue of greenhouse gas emissions: integrating solar-thermal technology into existing fossil fuel power plants. Instead of trying to completely replace what’s already up and running, this strategy provides time for a gradual shift in the power supply and gives the engineers running the plants a chance to familiarize themselves with the technological changes while giving them a safety net to fall onto should something go awry. A study published in the journal Nature has shown that this “bridge” approach between the two sources of power would be cost-effective and ecologically-friendly. The authors demonstrate that these so called “solar-aided” plants can achieve highly efficient ratios of solar-to-electric conversion, without running into issues that limit other solar power plants. Their analysis finds that by heating transfer fluids to a benchmark 400 degrees Celsius using solar energy, fossil fuel consumption can be reduced between 28 to 57 percent in powerplants that use a specific type of heat-engine, based on the Rankine cycle – where heat is converted into mechanical work in order to produce electricity. That’s half of the coal, and half of the emissions. By reducing fossil fuel combustion, integrating solar-thermal power into existing power plants can significantly reduce greenhouse gas emissions. To achieve this, the power plants should be operated in a “fuel-saving” mode, where their thermal storage can be used to make up for times when the solar intensity is low or in order to continue to supply electricity during peak demand hours, such as right after sunset. And best of all, this reduction in fossil fuel use can be obtained with minimal changes to the plant. Ivanpath solar-thermal installation, that ran into a bit of a pickle recently. Solar-aided power plants can fall-on their fossil fuel back-up systems in cases such as this. The study also revealed that retrofitting existing power plants in this manner is actually a better way of mitigating greenhouse gas emissions than carbon capture and storage. Integration of solar-thermal energy generation technology is cheaper, and it eliminates the need for reservoirs to contain concentrated, pressurized carbon dioxide. The integration strategy has already been tested in a few locations with promising results. Experience obtained with utilizing this method has allowed for a more modular version of the solar-thermal technology to be developed. Now, it is also more adaptable to local conditions, enabling deployment at sites with constraints such as limited land. A modular approach is also more attractive because smaller plants enable more access to finance and will create more resiliency. Solar-thermal integration into classic power plants would allow us to ween-off fossil and transition into renewables in a more strategic manner. Solar-aided plants have already proven themselves to be more cost-effective than solar-thermal and fossil fuel plants. However, few of them have been built so far – less than a tenth of all installed solar-power capacity worldwide. As the legislative policies stand, these types of solar-aided plants do not receive the same incentives that are provided to pure solar-thermal power plants. However, there are clearly myriad benefits for running solar-aided plants, and the authors hope that policymakers will acknowledge and address this reality.